What is Neighborhood Watch? Neighborhood Watch is a crime prevention program that provides “extra eyes and ears” in the community. 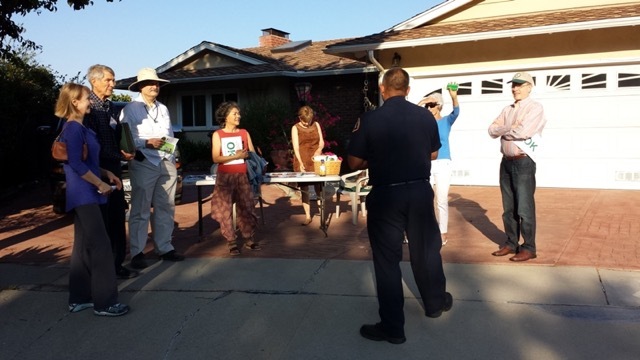 Neighborhood Watch bridges law enforcement and citizens together for the protection of their communities by having neighbors watch out for neighbors and report suspicious behaviors to the Sheriff’s Department. Learn how you can set-up a Neighborhood Watch in your neighborhood or enhance the program in this detailed Neighborhood Watch Toolkit, which also includes important Crime Prevention resources! Homeowners Association Neighborhood Entryway Camera Grant Program - The new camera grant program for homeowners associations (HOA’s) provides a one-time, $1,500 grant to neighborhood associations to fund the purchase and installation of security cameras at the neighborhood’s ingress and egress points. All formal HOAs in the City are eligible. To apply, the HOA must submit a letter of interest or HOA resolution to the City. For more information on the selection process and how to apply, click/tap here. Neighborhood Security Camera Right-of-Way Agreement - The neighborhood camera right-of-way agreement allows formal HOAs within the City to place security cameras on City property at the entrance of their neighborhood, only if private property is unavailable, ineffective, significantly more expensive, or aesthetically undesirable. Interested associations may submit a letter of interest or HOA resolution to the City for consideration. For more information on the selection process and how to apply, click/tap here. Nixle is a free public safety phone or email alert system that offers timely emergency and public safety information. Go to the Nixle site directly and click “Sign Up Now” and follow the instructions for your home area and preferences. Text RHECITY to 888-777 to subscribe to the City's alert and emergency notification system and/or RHEHORSES to 888-777 for equestrian related alerts and notifications only. For non-emergency phone contact, please call the station directly at (310) 539-1661. For emergencies, call 911. Register for Nextdoor, an online neighborhood outreach and posting site, at www.nextdoor.com where the City also posts important City news and event information. Make sure your neighborhood joins in on National Night Out (NNO) each August! Connect with the City at 310-377-1577 to learn more.